The I2C analyzer sink decodes analog data on an I2C bus to I2C data. Just measure the Clock and Data lines of the I2C bus with a scope and connect the measuring channels to an analyzer sink. The I2C analyzer always needs two sources: the first connected source will be used as I2C SCL (clock) and the second connected source will be used as I2C SDA (data). I2C communication uses 7 bit addresses, followed by a bit that indicates a read (1) or write (0) of that address. The I2C analyzer displays the 7 bit addresses in its output. All read and written data displayed by the I2C analyzer is shown in hexadecimal format, only addresses are prefixed with 0x. The sink uses a window for its output. The output can be saved to a text file. Note: Currently I2C High Speed mode is not fully supported. I2C uses device addresses to communicate to specific devices on the bus. For easy recognition of the devices in the decoded data, the I2C analyzer supports address aliases. Address aliases can be added and changed on the Aliases page of the output window. Add an address item to the list of address aliases. Edit the address alias of the selected item in the list of address aliases. This can also be achieved by double clicking the address field on the selected line. Remove the selected address item from the list of address aliases. Load a file with address aliases. Save the current list of address aliases to a file. To control the behavior of the I2C analyzer sink, several properties and actions are available. These can be accessed through a toolbar with buttons at the top of the I2C analyzer output window and through a popup menu which is shown when the sink is right clicked in the Object tree. I2C supports two different bus voltages: 3.3 and 5 V. The Voltage property needs to be set accordingly for proper decoding. The default value is 3.3 V. The Voltage property is available through the popup menu. 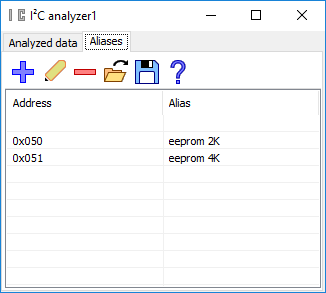 The Clear action ( ) clears all text from the I2C analyzer output window The Clear action is available as button on the toolbar. The I2C analyzer always needs two sources: the first connected source will be used as I2C SCL (clock) and the second connected source will be used as I2C SDA (data). When the sources are connected the wrong way, the Swap inputs action ( ) will correct it. The Swap inputs action is available as button on the toolbar and through the popup menu. The Auto scroll to bottom property ( ) makes the I2C analyzer output window scroll to the bottom of its content each time new data has arrived, making the latest data visible. The Auto scroll to bottom property is available as button on the toolbar. The Export data action ( ) saves the content of the I2C analyzer output window to a text file. The Export data action is available as button on the toolbar. 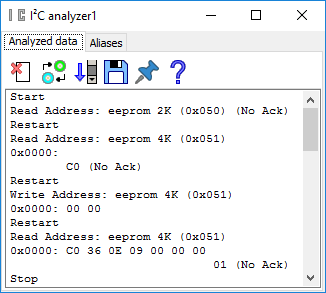 When the Always on top property ( ) is switched on, the I2C analyzer output window cannot be hidden under other windows of the Multi Channel oscilloscope software. The Always on top property is available in the popup menu. See common properties and actions. The Gain/Offset I/O multiplies a signal with a constant gain factor and adds a constant offset. The Limiter I/O limits or clips a signal to a certain range. © Copyright 2019 TiePie engineering. All rights reserved.